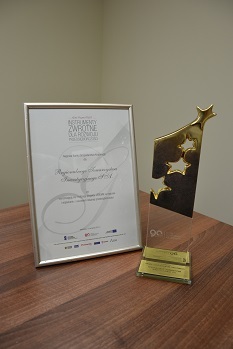 Regional Investment Company (Regionalne Towarzystwo Inwestycyjne S.A.) one of the pioneer institutions for regional and local development in Poland, launched its activities in 1994. It was formed on the initiative of the local authorities actively supported by local businesses. RTI is a non-profit organisation. All income is devoted to a statutional aims. We were one of the three institutions in Poland, which received funds to provide financial guarantees for bank’s credits. In 1995 RTI S.A. signed the first contract with the Cooperation Found. Since then, the financial services are still continued and developed. For twenty years RTI has been creating conditions for the development of enterprises in our region and social-economic cohesion in order to improve the competitiveness of Polish SMEs. RTI realizes its tasks by providing of financial services, consulting and information for start-ups and experienced companies. RTI provides assistance to businesses through implementation of actions aimed at using innovative solutions, development of human resources and regional development. RTI contributes to the improvement of the competitive position of local business both on the national and European Union markets. The key to our success are customer’s satisfaction and appreciation from local community. RTI provides a high-quality services which is already certified by ISO 9001:2001. 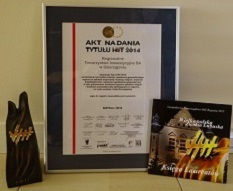 2009 - the first prize from the Marshal of Pomorskie voivodship for the projects “Time for business”. 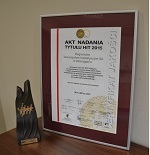 2014 - the prize “HIT 2014” for the creation of socio-economic conditions for development of the region and support the development of SMEs. technical and administrative assistance of EU programs. financial support of professional trainings for unemployed and disadvantage people. implementing projects for farmers, unemployed and disadvantaged groups. access to regional and national business support institutions. For many years RTI has been cooperating with entrepreneurs. It is a bilateral cooperation. On one hand these companies are RTI’s customers. On the other hand they support us in implementing our projects (internships, vocational training, subsidised employment). Phare PMC P9109/MIT/13 (1995) - the project involved the recapitalization guarantee fund, providing financial services - guarantees agreement with the Fund Co-operation in the framework of the Private Sector Development Programme P9109 - Ministry of Industry and Trade, funded by the Government of the Republic of Polish donated funds to the Commission of the European Communities. STEP IFE/199 (1999) - the project involved the recapitalization guarantee fund, providing financial services - guarantees agreement with Polish Foundation for the Promotion and Development of Small and Medium Enterprises. FPK-PL/DM/10/1138 (2001) - the project involved the recapitalization guarantee fund, providing financial services - guarantees agreement with the Polish Agency for Enterprise Development (PARP) in the execution of tasks resulting from the recording of the document "Government Policy Guidelines for Small and Medium Enterprises to 2002". 02/51/IF/03 (2003) - The project involved the recapitalization guarantee fund, providing financial services - guarantees agreement with the Polish Agency for Enterprise Development in the implementation of tasks resulting from the recording of the document Fri "Government Policy Guidelines for Small and Medium Enterprises to 2002". Sectoral Operational Programme Improvement of the Competitiveness of Enterprises (2005) - the project involved the recapitalization guarantee fund, providing financial services - guarantees. Donor funds was the Polish Agency for Enterprise Development. Pomorskie Regional Operational Programme (2009) the project involved the recapitalization guarantee fund, providing financial services - guarantees. 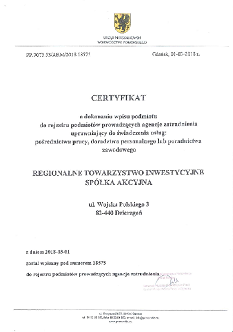 Donor of the Pomorskie Regional Board was represented by the Pomerania Development Agency. Project co-financed by the European Regional Development Fund. 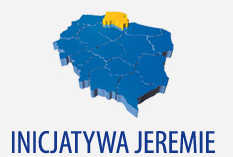 Pomorskie Regional Operational Programme (2012-present) Non-grant financial instruments for SMEs – loans and guaranties within JEREMIE (Joint European Resources for Micro-to-Medium Enterprises). Project co-financed by the European Regional Development Fund and the State Budget. Pomorskie Regional Operational Programme - “Nadwiślańskie Business Center” (2013-2015) - a business incubator stimulates and enhances the entrepreneurship in our region, especially the one based on innovations. The incubator supports start-ups in the first period of their activity. "Consultation - Advisory" (2000–2004) - Rendered information and advisory services for start-ups and established businesses. The program was financed by the Ministry of Economy. Sectoral Operational Programme - "Improvement of the Competitiveness of Enterprises "Building a network of Consultation within the National SMEs Services Network" (2005-2008 ) The project consisted of providing free information services for SMEs and start-ups. Human Capital Programme - "Support for the comprehensive information service for businesses and individuals wishing to start a business by funding network of Consultation" (2008-2013). Pomorskie Regional Operational Programme - "Local Information Point of European Funds" in the framework of European Funds Information Network in the EU" (2009–2013). The project is to provide a coherent information policy on the acquisition of EU funds. 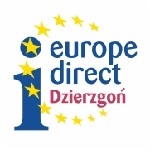 Europe Direct Information Centre (since 2013) – information service for citizens on EU rights, funds and programmes, distribution of EU documents and publications, redirecting to other information sources and relevant organizations if necessary. Human Capital Programme - "Partnership Office - Integration, Animation, Development” (2008-2011). The project consisted of the creation of the Partnership Office for human resource development. Human Capital Programme - “Time for changes–time for you!” (2009–2010) - professional trainings and job trainings for unemployed, which takes place at the entrepreneurs. Human Capital Programme - "Time for business", "Time for a business in the county Sztum" (2010–2012). Projects involving the granting of financial support and advisory for starting a business. Human Capital Programme - "Believe in yourself" (2010) - the project consists of activities for uneployed. Human Capital Programme - "Active lesson of history" (2012) - the project consists of activities for uneployed and disabled. Human Capital Programme - "Development Academy" (2012) - the project consists of activities for unemployed. Human Capital Programme - "New skills – new opportunities" (2012) - the project consists of activities for unemployed. Human Capital Programme - "Education for all" (2012) - the project consists of activities for disabled. Human Capital Programme - "In literature and theatre world" (2012) - the project consists of activities for disabled. Human Capital Programme - "Helping Hand" (2012–2014) - the project consists of activities that helps to increase employment of people with disabilities. Human Capital Programme - "Take a chance!” (2013-2014) - the project activating disabled and unemployed people. Human Capital Programme - “In new role” (2014-2015) – project for farmers and their family members. Rural Developemend Programme - "Implementation of local development strategies” (2014) - Organization of training and advisory support for entrepreneurship for 15 women living in the Dzierzgon area. Rural Developemend Programme - "Implementation of local development strategies” (2012) - “Entrepreneurship for young people”. Rural Developemend Programme - "Implementation of local development strategies” (2014) - Organisation of trade fairs for businesses and residents from our region. Europe Parliament Elections (2014) - the goal of the project was to carry out activities aimed at encouraging young people to participate in elections to the European Parliament in 2014. Other initiatives: workshops for youth “Entrepreneurship as your chance”.